Note: Other sizes and colors are available on each Lifevest displayed. 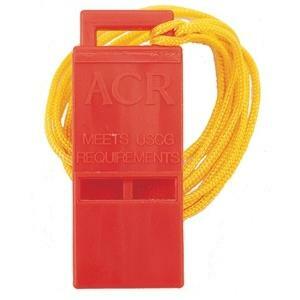 West Marine Storm Safety Whistle . Sounds a powerful blast! The loudest whistle you can buy, even if it s drenched. Special self-draining chambers quickly purge water so it can sound a blast many times louder than U.S. Military whistles. You can even hear it underwater! Plastic construction with easy-to-grip ridges. Kwik Tek, . Safety Whistle On Floating Lan . In most states, an audible signal device is required on PWCs. This high-pitched whistle is a good choice. Clip to your life vest or safety lanyard. It even doubles as a floating key chain! The Fox 40 Micro Marine Safety Whistle works where your cell phone won?t and is never muted by weather conditions. A must have for any boater or outdoor adventurer who puts a premium on safety and security, the slim Micro Marine Safety Whistle produces up to 120 decibels of high-pitch tweeting. Plus, this pealess whistle has no metal parts which eliminates the possibility of rust, corrosion, and UV or saltwater damage. Assorted colors. Product No. 2228 Carded Gets attention! Loud, shrill, dual tone audible from great distance Unique flat design prevents holding water Required by SOLAS 83 Meets USCG/SOLAS requirements Aids in land or sea rescues Use on life jackets, vests, foul weather gear, ring buoys, rafts, key chains, etc. Developed for the U. S. Navy; used by NASA, major airlines and shipping companies Complete with 18 and quot; - 45. 5 cm - of lanyard. Fuel Whistle Fuel Whistle 5/8"
Fuel Whistle Fuel Whistle 5/8" Green Marine Products Fuel Whistle - FUEL WHISTLE 5/8"
Keep your kid safe on the rivers and lakes with the NRS Youth Vista Life Jacket. Seven adjustment points provide a comfortable, secure fit while your kid kayaks or hangs out on the river raft. Keep your little one safe out on the water with the Extrasport Volks Jr. Personal Flotation Device. This soft, breathable, and quick-drying PFD keeps your kid comfortable while he or she tackles nearly any water sport. Adjust the side straps on the Volks Jr. Personal Flotation Device to fit your child comfortably. Extrasport gave this life jacket a deep cut neckline and large armholes so your kiddo can move however he or she wants. The Kokatat OutFit Tour Personal Flotation Device's fully featured design works well for paddlers who take on adventurous trips that require lots of safety gear. Two front pockets hold anything from a GPS to a cell phone to your flip line. Kokatat also added an internal pocket to hold your car key, so you don't have to break into your own rig at the take-out. The OutFit Tour Personal Flotation Device uses a front flap design to create a slim profile, and six side straps lock this PFD in place to prevent ride up when you're in the water. Get into the Extrasport RetroGlide Avenger Life Jacket in a snap thanks to its easy side-zip entry.